Title: Victory concerts at the Metropolitan Museum of Art Free to the public / / Byron Browne. 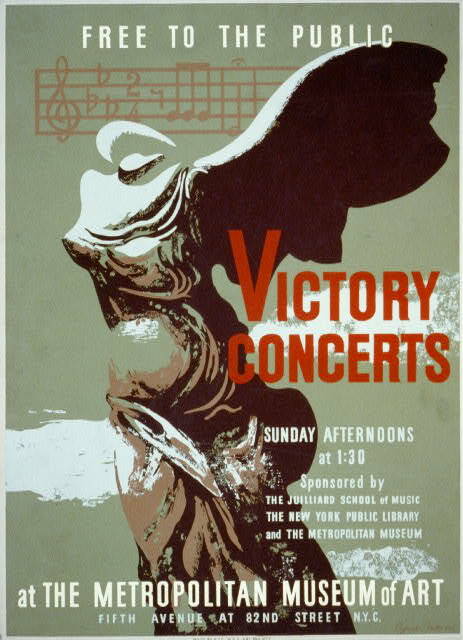 Summary: Poster for free "victory concerts" at the Metropolitan Museum of Art, Fifth Avenue at 82nd Street, New York City, showing Nike of Samothrace. Sponsored by: The Juilliard School of Music, The New York Public Library, and The Metropolitan Museum.